Ngô Thanh Vân's latest film Cô Ba Sài Gòn is finally set to debut in theaters next month on November 10th after being pushed back from its original August release date. Like NTV's past project Tấm Cám: Chuyện Chưa Kể, Cô Ba Sài Gòn draws upon Vietnam's rich history for inspiration. Set in Saigon during the 1960s, Cô Ba Sài Gòn follows the journey of seamstress Như Ý -- the heir apparent of House Thanh Nữ. As she takes on other tailors battling for the throne of top fashionista, Như Ý must protect the sacred family tradition of sewing the Vietnamese "áo dài" from white walkers and foreign influences invading from the West. Hold the door! Was I talking about Game of Thrones or NTV's newest film here? I forget. Anyways, peep the trailer for Cô Ba Sài Gòn here. Like all big budget Vietnamese films usually do these days, Cô Ba Sài Gòn is getting that hype train started by releasing OST MVs. Who better to call than ya boy Only C (the OST god) and ya girl Đông Nhi (the marketing mercenary)? Seriously...has there been a Vietnamese blockbuster movie recently released where Only C wasn't involved in the creation of the OST? Is there a product that Đông Nhi won't promote? I think not. In promoting Cô Ba Sài Gòn, NTV's marketing team has relied heavily on the nostalgic appeal of retro fashion and imagery. Here in the official lyric video for Cô Ba Sài Gòn by Đông Nhi seen above, the visuals are inspired by American pop art with J. Howard Miller's "We Can Do It!" poster from 1943 used as the basis for a lot of the art direction. As you can see, the retro theme (see Lip B's AOAA) is still going strong in Vietnamese media. Personally, I'm pretty hyped for the release of Cô Ba Sài Gòn. Pretty visuals? 1960s Saigon? A history lesson on the áo dài? Ninh Dương Lan Ngọc?! Count me in! Lan Ngọc > Yoona if you ask me. I don't even care that this Only C X Đông Nhi OST song isn't that good. It's just okay. I expect more from both Only C and Đông Nhi. Instead, I probably would rather listen to the disco-inspired Cô Ba Sài Gòn by Phúc Anh Singer or the old school Vietnamese bolero classic Biển Tình by Thanh Tuyền, which was used to promote the film. Even though this tailor-made OST lyric video by Only C and Đông Nhi was a bit of a let down, I'm still hyped with an "af" at the end for Cô Ba Sài Gòn. Only C and Đông Nhi Tailor-Make An OST For "Cô Ba Sài Gòn" **Ngô Thanh Vân's** latest film **Cô Ba Sài Gòn** is finally set to debut in theaters next month on November 10th after being pushed back from its original August release date. Like NTV's past project **Tấm Cám: Chuyện Chưa Kể**, *Cô Ba Sài Gòn* draws upon Vietnam's rich history for inspiration. Set in Saigon during the 1960s, *Cô Ba Sài Gòn* follows the journey of seamstress Như Ý -- the heir apparent of House Thanh Nữ. As she takes on other tailors battling for the throne of top fashionista, Như Ý must protect the sacred family tradition of sewing the Vietnamese "áo dài" from white walkers and foreign influences invading from the West. Hold the door! Was I talking about *Game of Thrones* or NTV's newest film here? I forget. Anyways, peep the trailer for [Cô Ba Sài Gòn here](https://www.youtube.com/watch?v=C4J_9BJy6gY " target="_blank" rel="nofollow). --- <iframe width="560" height="315" src="https://www.youtube.com/embed/vr-JdNDEx4c?rel=0&amp;showinfo=0" frameborder="0" allowfullscreen></iframe> --- Like all big budget Vietnamese films usually do these days, *Cô Ba Sài Gòn* is getting that hype train started by releasing OST MVs. Who better to call than ya boy **Only C** (the OST god) and ya girl **Đông Nhi** (the marketing mercenary)? Seriously...has there been a Vietnamese blockbuster movie recently released where Only C wasn't involved in the creation of the OST? Is there a product that Đông Nhi won't promote? I think not. In promoting *Cô Ba Sài Gòn*, NTV's marketing team has relied heavily on the nostalgic appeal of retro fashion and imagery. 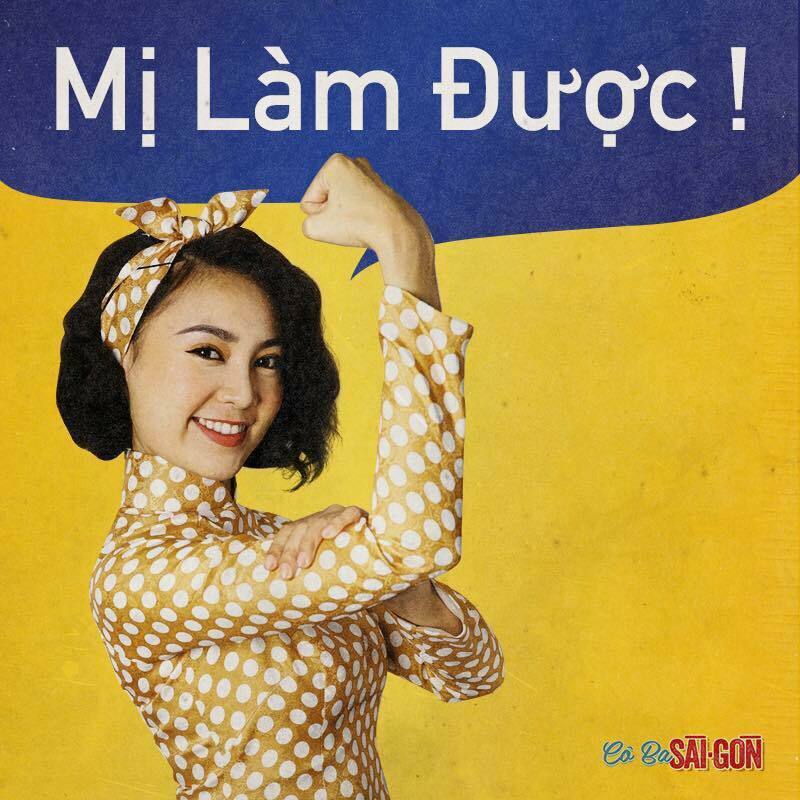 Here in the official lyric video for *Cô Ba Sài Gòn* by Đông Nhi seen above, the visuals are inspired by American pop art with J. Howard Miller's "We Can Do It!" poster from 1943 used as the basis for a lot of the art direction. ! [We Can Do It](http://i.imgur.com/0L0vJl6.jpg) As you can see, the retro theme (see [Lip B's AOAA](http://vpopfan.com/2017/07/26/lip-b-go-retro-to-holla-at-some-boys-in-anh-oi-anh-a/ " target="_blank)) is still going strong in Vietnamese media. Personally, I'm pretty hyped for the release of *Cô Ba Sài Gòn*. Pretty visuals? 1960s Saigon? A history lesson on the áo dài? Ninh Dương Lan Ngọc?! Count me in! [Lan Ngọc > Yoona](https://i.imgur.com/FQaQsgg.jpg " target="_blank) if you ask me. I don't even care that this Only C X Đông Nhi OST song isn't that good. It's just okay. I expect more from both Only C and Đông Nhi. Instead, I probably would rather listen to the disco-inspired [Cô Ba Sài Gòn by Phúc Anh Singer](https://www.youtube.com/watch?v=LdMzrBtI01Y " target="_blank" rel="nofollow) or the old school Vietnamese bolero classic [Biển Tình by Thanh Tuyền](https://www.youtube.com/watch?v=DPXoK-2XlSw " target="_blank" rel="nofollow), which was used to promote the film. Even though this tailor-made OST lyric video by Only C and Đông Nhi was a bit of a let down, I'm still hyped with an "af" at the end for *Cô Ba Sài Gòn*.